3 UCLA Basketball Players Are Detained By Police In China; Shoplifting Alleged : The Two-Way The Pac-12 says that several UCLA players were "reportedly arrested." They were taken into police custody in Hangzhou, China, after reportedly being accused of shoplifting. 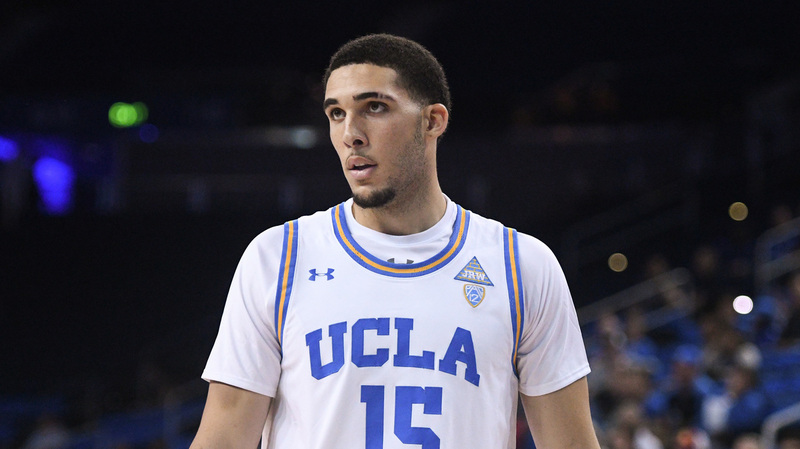 LiAngelo Ball is one of three UCLA basketball players who were detained in Hangzhou, China, reportedly over suspicions of shoplifting. UCLA basketball player LiAngelo Ball and two other Bruins were taken into police custody in Hangzhou, China, after reportedly being accused of shoplifting. The Pac-12 says that several UCLA players were "reportedly arrested." The players in question — Ball, Jalen Hill and Cody Riley — have been released on bail, ESPN reports, adding that the three "were questioned about stealing from a Louis Vuitton store next to the team's hotel in Hangzhou." All three players are freshmen; Ball is a younger brother of NBA player Lonzo Ball. When asked about the matter on Wednesday, UCLA coach Steve Alford said, "Those individuals won't play Saturday." The Bruins traveled to China this week as part of a showcase of Pac-12 conference teams, which is the result of a partnership with Chinese retail giant Alibaba. ESPN says that after police came to the players' hotel, Ball, Hill and Riley were taken to a police station for further questioning, accompanied by interpreters and team representatives. Citing a source with direct knowledge of the matter, ESPN says that since the players have been released, they "are being required by Hangzhou police to remain at the hotel until the legal process is over." UCLA is slated to play Georgia Tech in Shanghai in a game that, because of time-zone differences, will be played Saturday morning in China and air Friday night in the U.S.
Before reports of the arrests emerged, Pac-12 Commissioner Larry Scott said earlier this week that the trip showed how sport "can play a role to improve the world by having peaceful, friendly exchanges between people." Mentioning the cultural exchanges that could take place on such a trip, Scott concluded, "We're happy the young men from UCLA and Georgia Tech will have a chance to experience that and I'm sure that will leave an indelible mark." An early version of this story included an Associated Press photo of Lonzo Ball, with a caption that misidentified him as LiAngelo Ball. We've replaced the image.